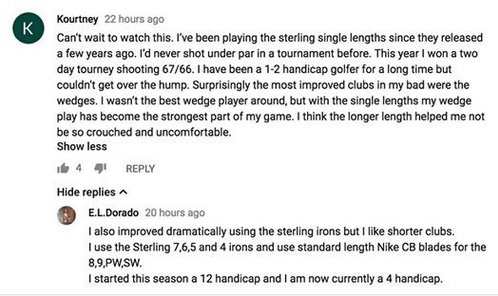 “I am finishing up on my 3 summer of playing the Sterling Irons® and I thought I would give an update to all of those that are thinking of giving SL irons a try. My game has continued to improve and I cannot think of a reason to go back to VL irons. I always laugh when I hear all of the nay sayers that haven’t given them a try. I’ll admit, they are probably not for everyone, but they really simplified the game for me and I feel like I can get away without practicing as much and still have a good feel for my swing since so much of the set up is the same. If you are struggling with hitting your chip shots fat, that I’ve got five things here that can hopefully help you improve the quality of your strike and you won’t be hitting them as fat so often. So, the first thing I would say, and this is going to lead into a couple of the other things is just to understand a little bit about your wedge here. So, if you look at the which here, as you come down the clubface, there is this point report that leads to the under part of the club face, it is kind of sharp, pointy angle here, that is called the leading edge, and underneath, there is this curvy part here called the bounce, and those two are important thing is with what I’m going to be talking about here because the leading edge is often called the digger, and the bounce is called the skipper, and why that is, is that if you have a lot of shaft lean in particular, it kind of exposes this leading edge – presents the leading edge more to the ground so if you are a little bit off with your ball striking and you catch it a little bit, the club is going to grab in that ground and dig in there. That’s why it’s called the digger and give you some problems, but if you’ve got the club a little bit more vertical like this, then you got a little bit protection with the bounce here, so if you catch a little bit fat, the bounce or the club is going to literally kind of keep the club from grabbing into the ground, and then you can get away with hitting at a little bit fat when you are using the bounce part. So, with that understanding, the first thing I would say is with your chips to just watch the amount of shaft lean that you have, you can have a little bit but be careful about having too much, I remember I was playing some balls with a guy in New York once and he just kept hitting his chip shots fat and fat, and fat and he’s getting really frustrated and he was just getting really down with about it, and so he asked me for my help after the round on the last green, and so we just went off to the side there and I’m like, well, geez, you got your shaft, you are playing a lob wedge, but you are putting so – I mean, it wasn’t this a much shaft lean but his shaft lean was so far forward that if he just barely missed the strike, that club was just taking in, and so that’s the first thing: watch too much shaft lean. It’s going to expose that leading edge to the ground, and it’s going to make your chip shots a little less forgiving with your striking, so watch the shaft lean. Second thing is to stand tall. All of our swings have a natural down part of the swing, a natural flat part, and that a natural upswing. So, you don’t need to try and hit down, you don’t need to try and hit up, just by swinging, there is going to be that arc to it, and that’s primarily dictated by the C7 vertebrae in your neck here where your neck and spine, and your shoulders intersect here, and wherever that is, is it’s kind of going to dictate where the bottom of what you can reach is. So, if you keep your stand pretty tall, not stand perfectly straight up and down like this, but just stand up a little bit, and then keep the bottom, the potential bottom of your swing arc up high enough so that as long as you stay up, you cannot hit it fat. So, that would be the second thing I would say, is just to stand tall, stand tall enough so that you cannot hit it fat. And then, the third thing I would say is to use a wedge with lots of bounce. Remember I said here that the bounce can help you – give you a little bit more forgiveness, I guess, as far as where you are striking, so if you have a wedge or a club with a lot of bounce, he can actually hit it a little bit fat in the club won’t lose steam, and it will still get through the ball, and your distance control will still be okay. So, with your wedges, with your sterling irons wedges, in particular the sand wedge, it’s can be like that with most other clubs as well, most other wedges, the sand wedge is the one that we designed that has the most amount of bounce, so this guy that I was talking about in New York in particular, he used to use a lob wedge with very, very little bounce, so not only was he leading the shaft forward, even if he had the shaft a little bit more vertical like this as he was coming through, he still had very, very little bounce on it. 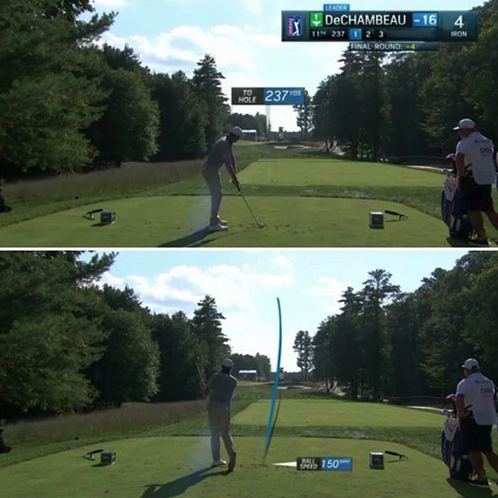 So, we just had him switch to – keep his shaft more vertical, we just had him switch to the sand wedge which gave a little bit less loft and hit the same trajectory of the shots that he wanted, but then he was using the bounce for one to his advantage, and he was using a club with more bounce. So then, all of a sudden, he started really striking these shots really crisply, but there were a couple other things that he was doing as well that he was kind of doing all of these things wrong. I want to say wrong, but they were contributing to his fat shots. The next thing I would say is to don’t hit down, don’t try and take a divot; try and sweep or collect, or pick the ball. Most of the top chippers these days, Steve Stryker for example, Zach Johnson, they don’t take a lot of divot, and this is starting to become a little more well-known even at the top professional ranks with the teachers and the players, so if you watch some videos on YouTube of some guys chipping around the green from tight lies, there just kind of brushing the ground, they are not really hitting the down on it and digging into the ground and taking a divot. So, that would be another thing if you are sweeping, collecting, picking the ball, it gives you a little bit more forgiveness, I guess, the likelihood of you hitting it fat is a little bit less than if you’re trying to hit down and take a divot. So, that would be the fourth thing. So, we switched – my guy that I was talking about to that and that helped him as well. And, the last thing he was doing which I also see a lot of was his ball position was a little bit far back in the stance. So normally, if say you have it in the center here, the club might be like this, but if this ball is more back in the stance, all of a sudden, this club is delofting like this, and remember the more the shaft leans forward, the more leading-edge can grab in the ground. So, he wasn’t really helping himself either by having a ball position in the back of his stance, so we moved the ball position a little bit more towards the middle so that it was kind of positioned that when the club was just about down or just bottoming up, that is where the ball was or that is where we put the ball, and that really helped his chipping as well. So, that’s all I want to say about that. Just to recap real quick here, watching the amount of shaft lean, have the shaft be a little more vertical or just slightly forward, stand tall to keep the bottom of your swing arc up so that you cannot hit it fat as long as you stand up. Use the wedge with the most amount of bounce. 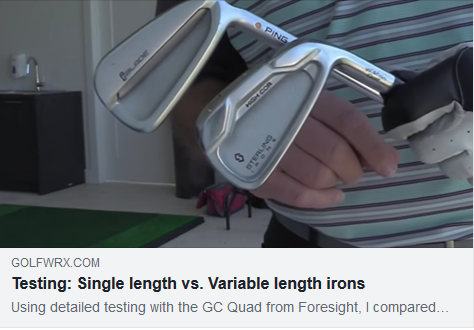 With the sterling irons, it’s good to be a sand wedge, and with most other wedges, it’s probably also going to be the sand wedge – not always, but most often, the sand wedge, and the technically, just try and sweep or pick, or collected, it’s going to be a little bit more forgiving type motions and heading down or trying to take a divot, and then also just to watch your ball position. I would say maybe have it be center-ish. There is no necessarily right ball position, but just make sure that your ball position is kind of where the club is coming down and just about all the way down, or just kind of bottoming out, and that is generally going to be a pretty good position for you to put the ball to keep you from hitting it fat. 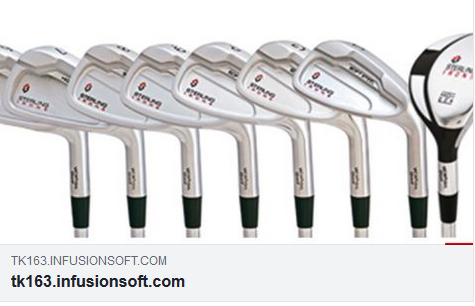 So, put those five things into play, give them a try, put them to work for you, and hopefully, that’s going to improve your ball striking and keep you from hitting these digging graves around the green and making bogeys and double bogeys, and all of your shots that. So, put them in play, give them a try, and hopefully, that will help you out a lot. Another week another win on the PGA TOUR for single length irons at the Dell Technologies Championship!